Welcome to the LOST FORTRESS site! Centuries ago, a dwarven fortress was lost. Sealed from the inside, never to be opened again. Miles around the place, forests fell into dust, green hills turned into a sterile desert. The cause of this event remained a complete mystery. Until a young dwarf adventurer found a secret way to get inside. Lead Kara, a dwarf adventurer, accompanied by her fellowship to explore the old fortress under the mountain, and solve the mystery of it’s fall. And, maybe, take back what was lost long ago. Meet Kara, fearless Dwarf adventurer. 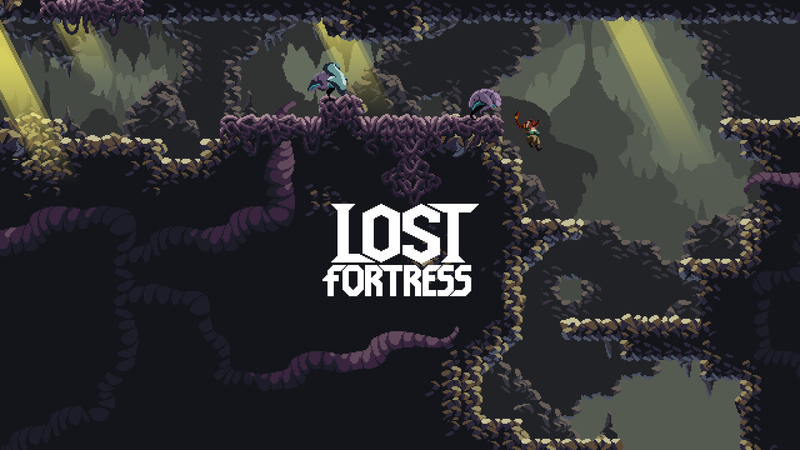 Lost Fortress is a Metroidvania inspired action 2d platformer. Freely explore this abandoned underground kingdom, face the danger of the unknown, uncover ancient secrets as you delve deep in the guts of the world. But beware, understanding this place is the key to success. Your decisions will have a lasting impact on this fallen kingdom. And, more importantly, on your friend’s fate. This site will be the home-base to follow the development of the game, I’ll post news about every step of the process and discuss various subject with anyone interested! The main focus of the game will be exploring the fortress, and what lies under it. Unlike classical metroidvania games, the rigid lock(obstacles)/key(special abilities) structure, leading the player to follow a predetermined path, will be way more open ended. The order in which the player will get new abilities and items will depend on the choice he makes, the area he explores first, which will lead to different experience depending on those decisions. But to really have a choice, the player must get informations, else it’s just a random pick. the game world will provide said informations, it’s up to the player to discover clues to make decisions based on he’s priorities, reinforcing the need to thoroughly explore the fortress. To explore the place, you have to be able to move around. The game will offer some means of travelling that are quite uncommon, but fast, and will provide ways to interact with the local ecosystem to produce interesting effects. Just know that travelling will get easier as the game goes, and obstacles like deep ravines or large pits won’t impede your abilities to move around for ever. The Dwarves won’t be alone. I can’t reveal much about the creatures they will face, but you’d be wrong to assume anything about them. There are rules that governs the presence of those creatures, the smart explorer should make a priority to understand those rules, and take actions accordingly. The player will have several weapons, from his traditional axe to some more exotic and dangerous artefacts. Ranged weapons will be a huge part of the combats, but enemies won’t make your life easy. The main specificity of the combat is the single resource used to activate the special abilities, fire your guns and to absorb damages: Aether. Blazing through enemies with your powerful guns won’t be the best way to make progress, as depleting Aether will make you extremely vulnerable. With no energy to power your shield, any wound will be fatal. You will have to make quick and smart decisions to stay alive! One of the common creatures that populate the Fortress, and a variation with protective front plating. Enemies diversity will grow as the adventurer make progress, offering new challenges. Know that this place doesn’t want you here. And it will take actions to make sure the Fortress became your tomb. The main protagonist, Kara, won’t be alone in this journey. She brings a party of fellow Dwarves with her, and each one of them will offer some vital services. Be it understanding the artefacts you find, using the precious Aether crystal, opening new paths, deciphering the History of the Dwarves or offering you a cold ale, they will be precious to you. They will hang in a central place, fortified, and each trip in the unknown will lead your further away from this safe place. To conclude, prepare yourself for a tough challenge, and keep your eyes peeled!